Stored procedures are programs in SQL which allow you to pass parameters to queries and manipulate sets of rows in tables. Find out how to write them with this online training blog! This blog is part of a complete SQL Server tutorial, and is also referenced from our ASP.NET online training blog. This page looks at this command in detail - but let's begin with a way NOT to create procedures. There's a good reason NOT to us sp_ as a prefix for your stored procedure. You can right-click as shown and choose to create a new stored procedure. 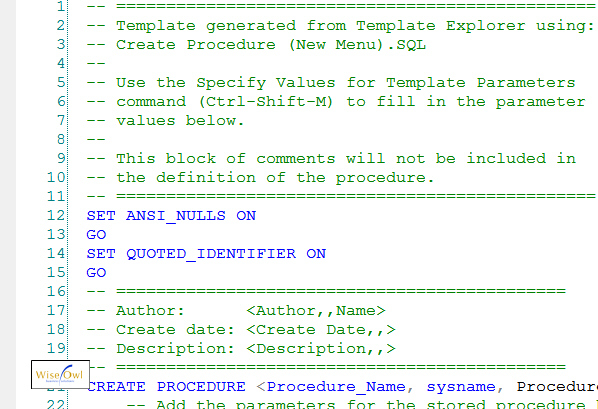 The start of the stored procedure template - how to confuse newcomers to SQL! You're better off writing your own code, believe me, which is what we'll look at now. -- pointless but necessary word! I have no idea why this word is necessary, but it is - the best thing to do is just live with the rule and try to remember it. You can optionally type in the word GO at the end of your procedure to finish this batch of commands, but it isn't necessary normally. You can click anywhere in your query and press F5, or click on the Execute button as shown here. All that you get for your effort - a message telling you that the command to create a stored procedure has run successfully. It's important to realise at this point that you haven't run the stored procedure; instead, you've run the command to create it! 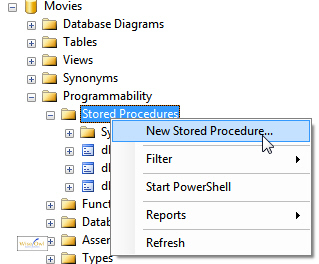 Where is your new stored procedure? 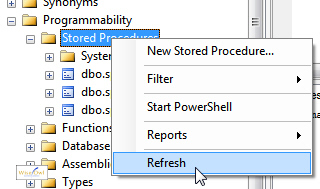 Right-click on the Stored Procedures category and choose to refresh it, as shown here. 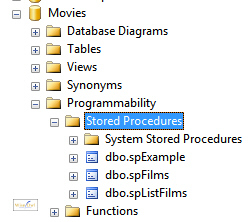 You should now see your new stored procedure (if, that is, you added it to the right database!). You can't create the same procedure twice! 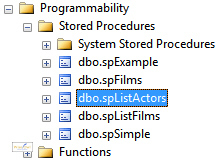 In this case, the thing to do would be to change the word CREATE to ALTER before running the SQL again, as described in a later part of this blog on modifying stored procedures. Having created your stored procedure, the next thing to do is find out how to run it! 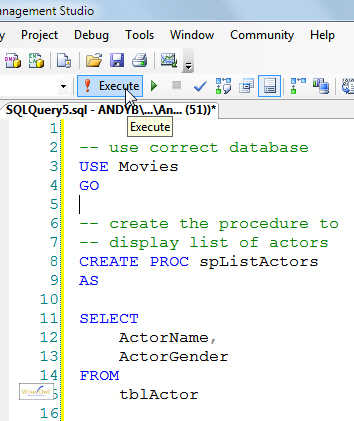 Don't forget that you can learn how to write stored procedures on our advanced SQL course, or visit our SQL training home page for more training resources.